An award-winning television and radio writer, Stuart has scripted a wide range of series dramas including Casualty, EastEnders, Holby City, and Peak Practice. 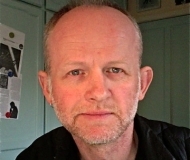 He was one of the key writers on The Bill, and part of the team that won the WGGB Best Continuing Drama Award 2008. Two of his episodes of Dangerfield were nominated for RTS Best Drama Awards in 2000. For radio, Stuart devised and co-wrote the critically acclaimed twelve-part youth drama series WICR, starring Ronnie Ancona, ('Energetic, fresh and very well constructed' - The Times). He adapted Jorge Amado's exuberant Brazilian novel Dona Flor & Her Two Husbands for Radio 4's Classic Serial. Other radio credits include Coming of Age (R4), about the arrival of a young asylum-seeker in a Sussex village; and Inmates (R4), co-written with Allan Sutherland, which received the Raspberry Ripple 'Best Radio Drama Award' for its representation of disabled people.